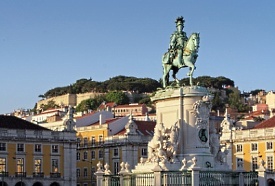 Cruises from Lisbon depart from spring through early winter. Classic squares and boulevards and extravagant castles and cathedrals make for some striking photographs in this stately Portugal city on the Tagus River. Tourists can savor the sights from St. George's Castle or from one of many overlooks. Excursions often feature the monument to Prince Henry the Navigator, a visit to the ancient Alfama district, a stop at Sintra National Palace and the Royal Palace at Queluz, and a port wine tasting. Administração do Porto de Lisboa, S.A. The Port of Lisbon is located approximately 10 miles from Lisbon's International Airport. Travel time between the airport and the pier is approximately 20 to 30 minutes. A free parking garage is available at the pier. Taxi fare is approximately 20 EUR. Rates are subject to change. From town - Follow sign to Alcantara, turn south. When in port area, turn east in roundabout. The Santa Apolonia Passenger Terminal is located approximately 6 miles from Lisbon's International Airport. Travel time between the airport and the pier is approximately 10 to 20 minutes. From the airport - Head west toward Alameda Comunidades Portuguesas and take the 1st left onto Alameda Comunidades Portuguesas. Continue to follow Alameda Comunidades Portuguesas and at the roundabout, take the 4th exit onto the Av. Marechal Gomes da Costa ramp to Parque das nações/Zona Portuária/Olivais Sul/Chelas. Merge onto Av. Marechal Gomes da Costa and continue onto Rua Cintura do Porto. At the roundabout, take the 2nd exit onto Rua Mar. Continue onto Rua Cintura do Porto and then continue onto Av. Infante Dom Henrique. Take a sight right followed by a slight left to stay on this road. Take another right and the destination will be on the left.